If you are looking for the best aerial lift platforms in the Chicago area or anywhere else in the U.S., look no further than Chicago Industrial Equipment. For more than 35 years, we’ve been a leading supplier of top-quality forklifts, telehandlers, scissor lifts and boom lifts from some of the most respected manufacturers in the industry. We proudly serve the lift equipment needs of companies in industries such as construction, forestry, agriculture and quarry and mines. 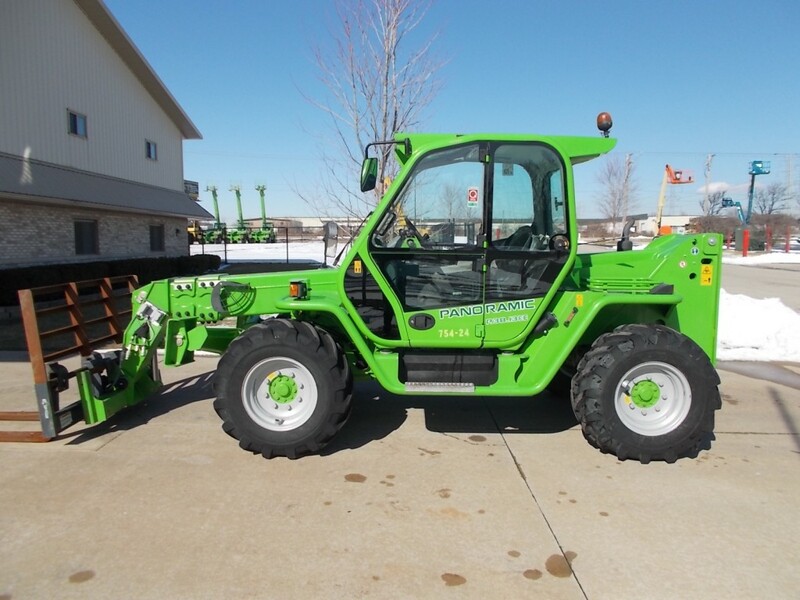 Our extensive inventory includes a wide selection of new and used Merlo equipment. Merlo has been designing, developing and manufacturing innovative forklifts, telehandlers and other industrial equipment for more than 50 years. Based in Italy, Merlo offers its products for sale via a large network of 600 dealers located all over the world. Merlo’s continuous focus on research and development ensures it always produces technologically advanced machines that increase productivity and lower operating costs. Compacts: Compact Merlo telehandlers are the perfect solution when operating space is at a premium. While they may be smaller in size, these versatile machines still deliver the high performance and remarkable comfort you need to get the job done. They offer the most spacious cab of any telehandler in its class, along with an innovative Load Sensing System that maximizes performance and minimizes fuel consumption. Turbofarmer: Specifically designed for agricultural use, the Turbofarmer telehandler line offers the benefit of decreased weight and dimensions for easier control and maneuverability. The combination of extraordinary reach and lift capacities of up to 1,100 POUNDS makes this the ideal telehandler for just about any farming application. With horsepower ratings as high as 156, the Turbofarmer has the power to tow trailers at speeds of up to 40 mph. Panoramic: Maximum visibility is essential for safe, productive operation of heavy equipment at construction and other industrial jobsites. The Panoramic telehandlers from Merlo offer excellent visibility along with a host of innovative technological features. Machines are available with rated load capacities of nearly 10,000 pounds and an impressive reach of nearly 60 feet. High Capacity: Merlo produces tough, durable telehandlers specifically designed for your most demanding lifting applications. These advanced machines enable leveling of the chassis to ensure safe operation on uneven terrain. Users can also optimize telehandler performance by adjusting speed and lifting power to meet the requirements of the specific task at hand. Professional: The Professional line of new Merlo telehandlers is the ideal solution for earthmoving, recycling and other challenging operating environments. The unique chassis design provides a visibility upgrade of 20 percent in comparison to the Panoramic models. The CS cab features a hydropneumatic suspension system that delivers superior operator comfort, even on rugged terrain. Roto: The aptly named Roto telehandler line includes machines offering the benefit of a 360-degree rotating turret, which provides an increased turning radius when compared to standard models. They also feature a reach of nearly 100 feet and a robust lift capacity of up to 6 tons. With engine power ratings of up to 176 horsepower and a state-of-the-art hydrostatic transmission, these telehandlers are engineered and built to deliver superior power and performance. Here at Chicago Industrial, we recognize that not every company wants or has the resources to purchase brand-new equipment. That’s why we complement our line of new Merlo equipment with a broad assortment of reliable used Merlo telehandlers and used Merlo forklifts. Used Merlo equipment offers a cost-effective alternative to new machines. All our used equipment has been expertly refurbished to like-new condition, ensuring you get a high-quality product that will serve you well for a long time to come. Our used Merlo equipment inventory includes late-model, low-hour units with many of the latest, most technologically advanced features. You may also find more seasoned models that provide substantial cost savings. Investing in a used telehandler can be a smart decision if you are looking for ways to conserve business capital or avoid the high costs associated with frequent equipment renting. We take all the guesswork out of purchasing used heavy equipment. We give you easy online access to detailed product descriptions that include product specifications, year, number of previous service hours and much more. You can also count on the expert guidance of our knowledgeable, experienced used equipment staff to help you make the best purchasing decision for your company. Chicago Industrial has a longstanding relationship with Direct Capital, allowing us to offer a number of flexible financing options. Direct Capital can provide instant financing of amounts up to $100,000 without requiring financial statements. Twenty-four hour turnaround times are included with most loan applications. Deferred and seasonal payment arrangements are also available to help you more efficiently manage your cash flow. Financing terms can range from 12 to 60 months. If you are worried about the cost of shipping your used or new Merlo telehandler, we can put your mind at ease. Our convenient, centralized location in the outskirts of Chicago allows us to ship to just about anywhere in the U.S. in a cost-effective manner. We also work with multiple trucking companies to obtain the lowest possible freight rates for our customers. If you’re not too far away, feel free to stop by our expansive 10-acre yard and 50,000-square-foot showroom in Rockford, Illinois, for an up-close look. We’re just a 50-minute drive from O’Hare and Midway airports. Discover why so many companies in Chicago and beyond are making Chicago Industrial Equipment their one-stop source for all their heavy equipment needs!